This year we celebrate the Aruban Carnival for the 57th year, as we conmemorate how in 1955, various clubs and districts were brought together for Aruba's first public Carnival with the first official Carnival queen. 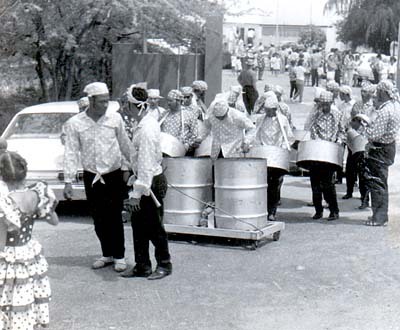 This Caribbean tradition has grown into a massive celebration throughout the years here in Aruba and in its 57 years it still maintains a lot of it roots. This is a celebration of and for the people and all parades unlike many other famous carnivals around the world are for free to watch here in Aruba. I believe that the parlament building near the Renaissance Hotel and Resort is one of the best sports for visitors to watch the Oranjestad parades. If you want a real bite of the carnival flavor, you can even join one of the groups if are looking for something different to do in Aruba during your vacation. Each year a series of carnival groups in cooperation with some of the hottest bands on the island present to all who want to participate creative themes and colorful costumes. These groups tend to get sold out by the end, but anyone can try to subscribe to the group with the theme they like most, and choose which parades to join in. For those simply wanting to test drive carnival in Aruba, you can try the torch parade (January 2011) and the San Nicolas lightning parade (March 3, 2011). These parades offer you the same level of fun, but are shorter and cheaper to join. If you are ready to go Pro, you can also join for the Grand Parade (March 6, 2011). If you are not ready for costumes, or get inspired by the music while watching a parade you always have the back up plan of joining what we refer as the last lap. The last band of a carnival parade is free to join for all who viewed the parade! Whether you want to just admire the beauty from the side of the road or join in the fun there are three parades of the Aruban Carnival that simply cannot be missed as they are the climax of our carnival season. These include the Oranjestad Lightning Parade, the Children's Parade in Oranjestad and definitely the Grand Parade in Oranjestad. You can find updates on dates and times in the event section of our website or on the official website of Aruba's Carnival Association (SAC). It's because the diecrt stare is seen as a threat.. Had you been a cat Earl may well have launched his claws at you! 14" of snow? I doubt we've had that much snow here since 1991!I get the feeling that cats have a memory of Bastet and would like us still to worship them.. Like? perhaps demand is more appropriate, Roland!He's either being macho or plain stupid.. where he was is pretty rotten and he could very well have fallen arse first through it!